How Access to the contextual menu ? Access to the contextual menu is only possible within a resource row, excluding grouped lines (configured as Levels). Add row: adds a new resource row to your Gantt. Color: Lets you customize your resource rows by choosing between 6 colors. Color choices are visible to all users. Edit notes: allows you to add descriptive information about your resources using a text editor. This feature is useful for preserving the history or any other data that is not structured within the schedule. Summary: shows the summary data for the resource, providing a concise view of the relevant information. It is possible to send this data by email (via the company email client) or by SMS (which requires a text/email messaging solution connected to PLANILOG). Expand/Collapse groups: allows you to reveal or hide the levels that have been configured. Copy/Paste tasks into overview: this feature allows you to duplicate for one or more resources the tasks that have already been entered. To do so, you must define the period to be copied and that on to which it will be pasted. Delete tasks: allows you to delete all the tasks assigned to a given resource in your overview. Delete: allows for the deletion of the selected resource, and all of its tasks. Start/Stop/See tracking: the tracking feature allows you to set a time-date stamp to a task to measure the exact time until the task is completed. 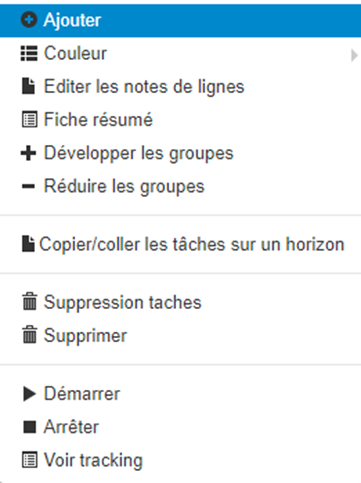 Each task therefore has its own individual tracking data, while a synthesis of all tracking data can be seen in the Tracking View (see Views section, below).